Since we were kids, we have been continuously told about this particular feline creature. We have been told to write essays, read stories and comprehensions about this majestic cat. The tiger is an animal every one of us is familiar with. It is the pride of India. It has been included in the syllabus of every kid, letting then know about our national treasure / animal, “Tiger“. We all must’ve seen the tiger one way or the other, either in zoo’s and safaris or on the television on channels like Discovery, National Geographic etc. But how much do we really know about this creature? The tiger is a feline creature. It comes under the “Panthera” species along with the lion, leopard, cheetah etc. It is the largest cat in the feline family. It has distinctive stripes on its head and body. These striped are visible even when the hair is shaved off. Unlike common belief, this not due to pigmentation on the skin but the fur stubs that remain. They are the biggest cats in the cat family, but their sizes vary from region to region. The Siberian and Bengal tigers are the biggest of the species. Tigers are listed among the creatures in the charismatic megafauna. Charismatic megafauna are large animals which are widely popular among the masses. Activists, environmentalists and radicals use these animals to reach messages to the people about conservation and species protection. They are carnivore’s animals, they eat flesh and meat. Though they are solitary predators, they do enjoy company. Their hunting grounds can be vast, sometimes even covering half the forests. The human encroachment into their hunting lands has created conflicts between the two. Tigers often enter villages by mistake and cause havoc as it is threatened by people around it panicking. Do we have the right to harm this animal? Are we doing anything to prevent such, situations? 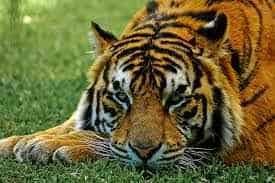 Tiger is the National animal of India.The tiger is the largest cat in the cat family. Every tiger is unique, that is, no two tigers will have the same pattern of stripes. They are solitary hunters, silent killers. They creep up behind their prey and pounce up behind them, biting their necks and choking them. Silent hunters, they are, but when a tiger wants to be heard, you will hear them for sure as their roars can be heard from up to 3 kilometers away. Tigers have been around since a long time, since fossils have been found that dated million of years back. There are various subspecies of tigers, the Bengal, Indo-Chinese, South Chinese, Sumatran and Siberian. The Siberian and Bengal tigers are the largest of these. The sabertooths, large prehistoric cats that lived with the dinosaurs and mammoths, are speculated to be the close ancestors of tigers. Tigers too are pretty big creatures. They can weigh up to 300 kilos and exceed 3-4 meters in length. But this fact does not hinder their speed because despite their size, tigers can still run at speeds exceeding 65 km/hr. The white tiger can only be found in India. Its colouration is due to a recessive gene and is not a form albinism. The tiger is one of the most popular animals in the world. It has been mentioned in many folk lore and stories. It even has key roles in some of these stories. It is the holy vehicle of gods in Hindu mythology, so they are relevant religiously too. When you look at it from a cultural point of view, it is the national animal of a number of nations. It is the national animal of India, Bangladesh, and Singapore etc. So you can say that it holds an important place in the country’s history and culture. About a hundred years ago, tigers could have been found throughout Asia. But due to excessive hunting and poaching, their numbers have considerably reduced. Tigers were brought close to extinction. Conservation efforts throughout the world have somewhat stabilized their numbers. More than half of the population of tigers in the world are in India. Strict regulations and penalties have been imposed on hunters and poachers. Tigers have been aggressively protected by India. Since it is a matter of pride, efforts have to be taken to preserve this majestic creature.